This 4n1 bounce house rental is brightly colored just for that special little girl in your life. The turrets are highly detailed and have enough flair to give the wow factor. The pictures do not do this unit any justice, it is beautiful. 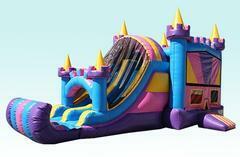 This combo bounce house rental features an inflatable ramp to provide comfort and safety upon entry. Once inside the children will experience a large bounce house area that features an inflatable hoop. Have some casual fun or friendly competition while they entertain themselves bouncing and shooting hoops. On the left side of the bounce area has a area with two climbing features that lead to the dual lane inflatable slide. They can race to the bottom and this slide means less waiting for the bouncers. Once at the bottom there is an inflatable bumper that ensures safety and a cushy landing. As they exit you will notice that they eagerly run back to the entrance to start the experience all over again. This Bounce house rental is sure to set your party off. 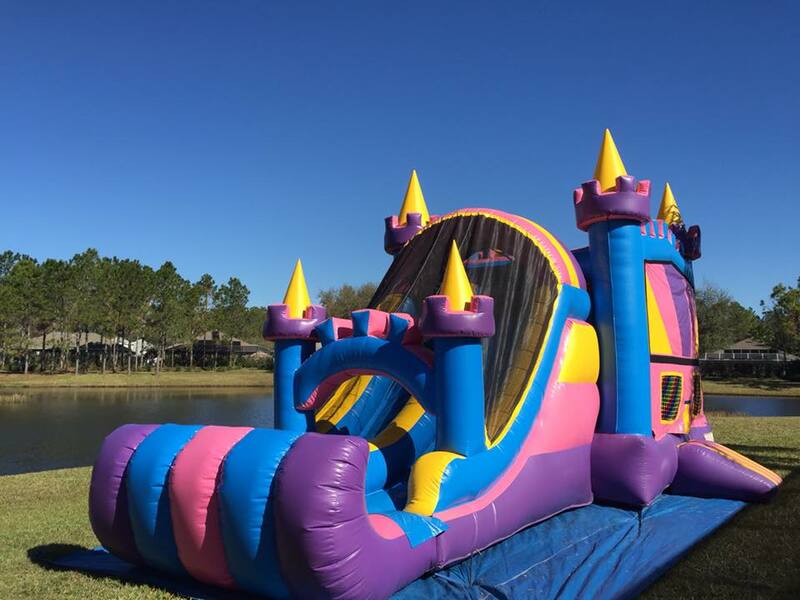 Be sure to check out our Water slide rental version of this 4n1 Combo Bounce house rental. If you are renting at a park you will need to Rent a Generator from us. Add Concessions to your Bounce House or Water Slide Rentals. 2- outlets are needed, they must be within 75ft of where we will be setting up and on a seperate circuit, we need two dedicated outlets for set up.